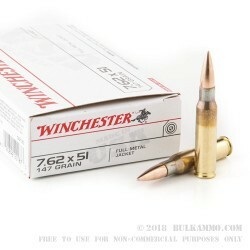 The well-known Winchester White box 7.62x51 made out of Oxford, Mississippi has a reputation for great loading and functional cycling in most military type weapons. 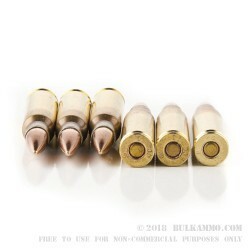 All said though, this ammunition is generally so reliable, the slight velocity differences; the dark smoke that can be prevalent at the end of the barrel and the just “good” accuracy are often overlooked in favor of seeing every round fire and hit the target. When it comes to ammunition, reliability is the most important factor. Hardware often has more to do with inherent accuracy then does the cartridge. Winchester is known for reliability in manufacturing of ammunition and has a long history of putting out great products. This round can achieve a velocity of 2800 feet per second and get about 2550 ft. Lbs. of energy at bore exit and is generally accepted as a general purpose ammo for target shooting. The FMJ projectile and the annealed cases meet a specification that is substantially similar to the M80 Mil spec. 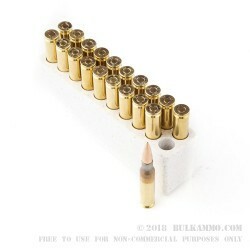 Due to the high reliability of this ammunition, it can generally be used in any 7.62x51 chambered firearm.